● Be sure to check out the Daily Deal for a steep discount on the featured item of the day. You can see your savings on the product description. ● Many items on the site are eligible for free shipping, as indicated on their individual product listing pages. Shipping is currently limited to the contiguous US. ● CowBoom has a 15-day money back guarantee. Visit this page for more information. ● Take advantage on seasonal sales promoted on the homepage where selected products are sold at reduced prices. ● Online coupons are for discounts of $5-20 off–either sitewide, with use of a coupon code, or only applicable to a minimum required purchase amount. 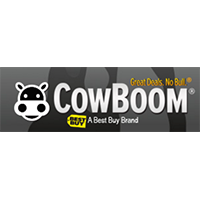 CowBoom is a Best Buy brand that offers a variety of different electronics that can be used for professional or personal use. Some of their most popular products include computers, gaming equipment, audio and video equipment, cellular devices, cameras, and more. You can take a look at all of their individual product categories on the tool bar found at the top of the front page. They always post a deal of the day which is a featured item that can be up to 90% off of its regular retail price. You can also look at the listed items on the right side of the home page which are the top products that they have been selling. For most up to date offers check out Cowboom on Facebook and Twitter or contact Cowboom Support for any questions.